This is a selection of Kathleen Stokker's publications and presentation. A beginning Norwegian textbook, co-authored by Norwegian native Odd Haddal. 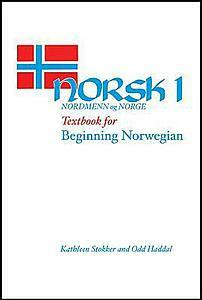 A textbook for beginning and intermediate Norwegian language that starts with simple sentences in Norwegian, and adds vocabulary little by little, using English only in explanatory footnotes. Its glossary defines all the vocabulary and also shows correct verb, adjective and noun endings as well as many examples of idiomatic usage. An intermediate to advanced Anthology of stories, poetry, songs and factual prose. Short texts written by and for Norwegians but selected with the intermediate language learner in mind. The anthology aims to provide entertaining and thought-provoking reading while enhancing the reader's understanding of Norway's social and linguistic history and present day reality. Hitler's forces occupied Norway from April 9, 1940 until May 8, 1945. To keep spirits up and to help foster the resistance many circulated anti-Nazi jokes and cartoons. They also wore paperclips, red stocking caps or sent subversive Christmas cards How did this seemingly frivolous humor contribute to the development of a resistance mentality in a country initially stunned by the German invasion? When the Norwegian immigrants settled in America, they brought along their Christmas customs. 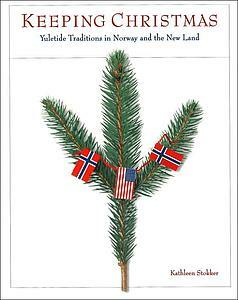 To what extent did the traditional Norwegian Christmas with its centuries-old customs that were rooted in Viking times survive its encounter with the newly invented American Christmas that aimed to unite a nation of multi-cultural immigrants? Nineteenth century Norwegians rarely consulted doctors, relying instead on home remedies and neighborhood healers trained only by experience. 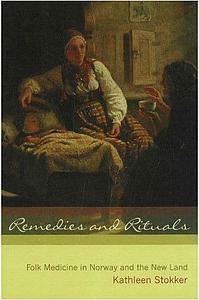 This book reveals the natural ingredients, magic potions, and whispered spells employed by these healers who often had to dodge harsh criminal laws to help their neighbors. Using a combination of rational and magical remedies, they treated everything from burns, broken bones, and whooping cough to stalled labor and emotional stress, and sometimes devised remedies that worked before science could say why. "Nytt norsk Tidsskrift and Jens Ernst Sars: Their Influence on the Modern Breakthrough in Norway" (Thesis prepared for PhD at University of Wisconsin, 1978). "To Catch a Thief: Binding and Loosing and the Black Book Minister." Scandinavian Studies. 61 (1989): 353- 374.
" 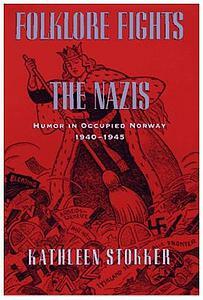 'Heil Hitler — God Save the King' : Jokes and the Nazi Occupation of Norway." Western Folklore. July, 1991. "Scandinavian Literary Journals" in Dictionary of Scandinavian Literature. Virpi Zuck, ed. New York: Greenwood Press, 1990: 531- 539. "Migratory Legend 3005: 'The Would-Be Ghost' — Why Be He a Ghost?" Arv: Yearbook of Scandinavian Folklore, 48 (1992): 143-152. "Oral Tradition, Humanism and the Baroque" in A History of Norwegian Literature, Harald Næss, ed. Lincoln : University of Nebraska Press, 1993, 39- 52. "Julebukk: Christmas Masquerading in Norwegian America." Norwegian American Essays, Knut Djupedal, et. al., eds. Oslo, Hamar, Stavanger, 1993. "Between Sin and Salvation: The Human Condition in Legends of the Black Book Minister." Scandinavian Studies 67 (1995) : 91- 108. "Snorre the Seal: A Norwegian Children's Book Goes Underground" in Studies of Popular Culture XVII (1995), nr 2: 51 - 60. "The Trikk of Norwegian Occupation Humor" in Folklore Interpreted: Essays in Honor of Alan Dundes, Regina Bendix and Rosemary Zumwalt, eds. Garland Publishing, Inc., 1995. "Hurry Home, Haakon: The Impact of Anti-Nazi Humor on the Image of the Norwegian Monarch" in Journal of American Folklore CIX (1996): 289-307. "Anti- Nazi Card Tricks: Underground Christmas Greetings in Occupied Norway " in The Journal of Popular Culture XXXI.1 (Summer 1997). "St. Olav" in Medieval Folklore. An Encyclopedia of Myths, Legends, Tales, Beliefs and Customs, Carl Lindahl, John McNamara and John Lindow, eds. Santa Barbara, CA: ABC-CLIO, 2000. "Narratives of Magic and Healing: Oldtidens Sortebog in Norway and the New Land" in Scandinavian Studies 73 (2001): 399-416. "What's in a Name: Quisling Humor in Hitler's Norway , Wartime Function and Postwar legacy" in Humor: International Journal of Humor Research, February, 2002. "'More than the Lord's Prayer': The Black Book Minister on the Prairie" in Crossings. Norwegian-American Lutheranism as a Transatlantic Tradition, edited by Todd W. Nichol. Northfield, Minnesota: Norwegian American Historical Association, 2003. Marking Time. The Primstav Murals of Sigmund Aarseth. Decorah, Iowa : Vesterheim Museum, 2003. "Norway" in Volume 3 (Europe) of The Greenwood Encyclopedia of World Folklore and Folklife. William M. Clements, ed. (Westport, Connecticut: Greenwood Press, 2006), 123-134. "...'And Where She Swept, They All Died' : Tales of the Black Plague in Norwegian Tradition." Viking. July, 1987. "Olsok: A Medieval Saint's Day Revives." Viking. July, 1987. "Legends of the Black Book Minister." The Norseman. January, 1988. "Before the Trolls Turned to Stone." The Norseman. March, 1988. "Envious and Envied: The Witch in Norwegian Folk Tradition." Viking. June, 1988. "In the Footsteps of Olav, Norway 's Super Saint." The Norseman. November, 1988. "Who was the Nisse?" The Norseman. November, 1989. "Julebukk: The Norwegian Art of Christmas Fooling." Viking. December, 1990. "Rjukan: In the Footsteps of Sabotage." The Norseman. 1: 1991 (14- 17). "It's Happening at Stiklestad." The Norseman. 2: 1991. "Wishing Wells and Sacred Springs: Treasure Troves of Norwegian Culture." Viking. April, 1991. "God norsk jul: Christmas in Occupied Norway." Viking. December, 1991. "Snorre sel: A Norwegian Childeren's Book goes Underground." The Norseman. November, 1991. "The Miracles of St. Olav: Secrets of a Medieval Altar." Viking. July and August, 1992. "The Folklore of Butter." Viking. November, 1994. "Secrets of the Black Book: Folk Medicine in Norwegian- America." The Norseman. November, 1995. "The Goat Cheese Tradition is Alive and Well in Undredal." The Norseman nr. 3 1996: 13- 16. "Traditons Hanging on the Tree: Ornaments Reveal the Spirits of Norway 's Christmas Past." Viking. December, 1998. "A Measure of Time: Carved Symbols and Notches Mark Days Great and Small on the Primstav, A Medieval Calendar Stick." Viking. April, 1999. "Kvann (Angelica): Norway 's Gift to International Folk Medicine." The Norseman. May, 1999. "Romjul Revelry." Viking. December, 2000. "Around the Tree." Viking. December, 2000. "Foreword" in The Black Book of Elverum, Mary Rustad, ed. Lakeville , MN : Galde Press, 1999. "Folklore Fights the Nazis": How Humor Haunted Hitler in Occupied Norway"
"Keeping Christmas: Yuletide Traditions in Norway "
"Folk Medicines on the Prairie"
"'Askeladden and His Eating Contest with the Troll' - It's Not the Happy Ending that Counts"
"'Askeladden and the Good Helpers' - Seeing the Value in all Those We Meet along the Way"